Just imagine it: You're waking from a long sleep and the man sitting next to you, the man you remember talking with before you fell asleep, now has the head of a horse. He neighs at you as if to say -Good morning! We're about the land.- You blink, confused, and look around to discover you're surrounded by and odd combination of horses and men. I'm just kidding. This will never happen on Air Horse One. There are (mostly) only horses on that 727. 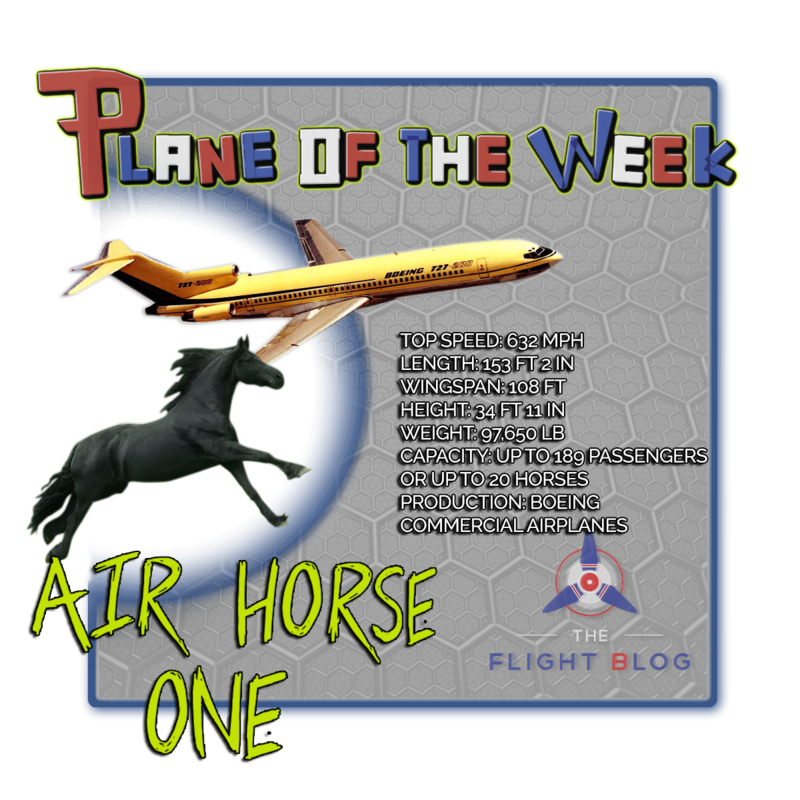 The Air Horse One is a Boeing 727-200 that is used to transport race and show horses around the country. The operation is run by H.E. -Tex- Sutton Forwarding Company and a one-way ticket costs just about $5,000. This ticket includes a trip for a groom, who gets a regular seat in the back of the plane, and a carry-on for the horse, which includes any special friends who can keep the horse calm aboard the flight, such as a goat. These friends share a stall with the horse. Tex Sutton started flying horses in 1969 and is still the only company to do so. Air Horse One is equipped with stalls for the horses and they are brought aboard via a ramp that connects to a trailer. This plane takes extra care in ensuring that the horses don't feel the effect of the flight too much. The crew takes extra care in ascending and descending, and they even make extra-wide turns. Air Horse One also gets priority in takeoffs at airports. The model plane that has been converted to transport these horses is the Boeing 727-200. Boeing only made one three-jet aircraft: the 727. The 727 features Pratt & Whitney JT8D engines, with one on either side of the rear fuselage and the other in the center, connecting an S-duct to the fin's base inlet. The 727-200 is an elongated version of the 727. It is 20 feet longer than the 727-100 and has two additional 10-ft. fuselages: one behind the winds and another in front of them. The 727-200's number-two engine was redesigned as well. Rather than the 727-100's oval shape engine, the -200's is round in shape. There have been just under 2,000 727s built, with the last one produced in 1984. These planes are often used domestically, as they were built for short to medium-length trips. Still, they can travel short to medium-length international flights. The design of the 727 was created with short runways and an independence from ground facilities in mind. These planes, armed with high-lift devices, do well in smaller airports because they can take off from a rather short runway with no difficulty. Their design is unique and they have proven effective over the years. The 727 can feature break wheels at the nose to shorten breaking distance upon landing, again making these planes extremely effective in smaller airports. However, this is one of the loudest airplanes of all commercial jets. As a result, 727s are required to be fitted with a hush kit or other noise reducers. Australian airports banned 727s in 2010, even those with hush kits, because they were simply too loud. The Boeing 727 has a lot of firsts in the world of aviation: the first featuring completely powered flight controls, the first to utilize both triple-slotted flaps and an auxiliary power unit, and the first to have been subjected to thorough fatigue testing. Starting out as a risky design with a planned production of only 250, the Boeing 727 has become one of the best-selling commercial jets in aviation history.